Ireland’s construction industry halved in size when the global recession took hold in 2008. Now that the sector is recovering, Lucy Alderson assesses whether the opportunities for UK contractors outweigh the risks in this challenging market. 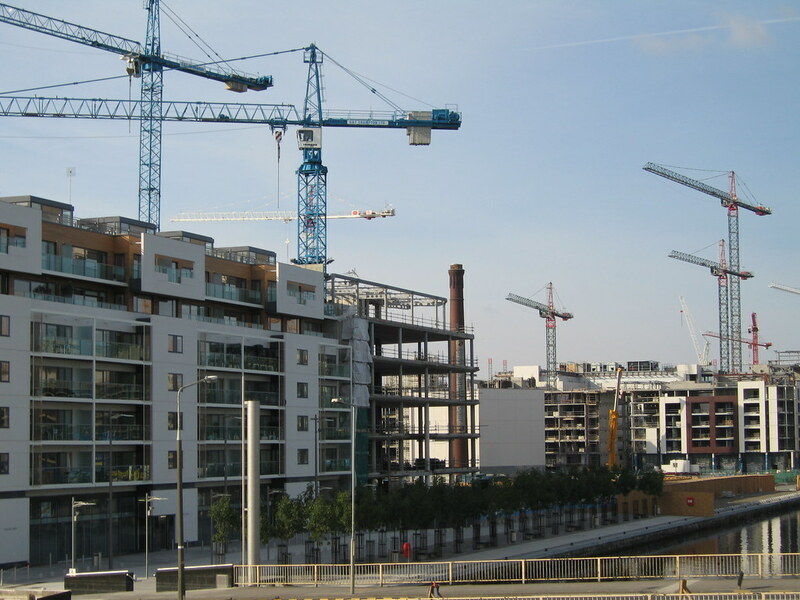 In 2007, the Republic of Ireland’s construction market was booming. Output from the sector stood at €38.6bn, accounting for 9 per cent of the country’s GDP. But the following year brought the global recession that sent Ireland’s construction industry plummeting. Output fell to €32.6bn in 2008 before crashing to around €18bn in 2009. The figures were described as “bleak” in an annual report published in 2010 by Ireland’s Department of the Environment, Heritage and Local Government. The report found that the Irish economy had suffered its worst performance on record in 2009. Oversea investment nosedived by 31 per cent between 2008 and 2009 as confidence fell, with a significant reduction in housebuilding a principal factor. By 2012 the Irish market had bottomed out, with construction activity reaching a low of €9.4bn. The sector’s annual output had lost €29.2bn in five years – 75 per cent of its value. But now, it’s making a comeback. In its Ireland Annual Review 2018 report, Aecom estimated that the country’s construction output will reach approximately €19.5bn this year. Although still some way short of pre-recession levels, this upturn in work presents opportunities for UK-based construction firms wanting to tap into a recovering sector. However, entering this market successfully is far from straightforward. In February, the Irish government published its development plans for the country over the next 20 years. Project Ireland 2040 sets out a 20-year pipeline worth hundreds of billions of euros, which includes: €116bn of investment in infrastructure; 550,000 homes; €2bn for regenerations of five major cities; €5bn Dublin Metro upgrade; and a second runway for Dublin Airport. Major projects and programmes are on the table; the question now is whether these projects can actually be delivered. In 2008 as the recession took hold, 49,200 people emigrated from Ireland, rising sharply in 2009 to 72,000. Those leaving included many construction workers looking for jobs elsewhere. This created a major skills gap that continues to plague the industry. To address this, the Irish government is pushing for international contractors to enter the market and bring with them much-needed skillsets – with UK contractors chief among the targets. Ireland’s government has opened its doors to UK firms, but this does not necessarily mean they will be able to integrate successfully into the market. According to Ireland’s biggest contractor by turnover, John Sisk & Son, there are several notable differences in how the UK industry operates compared with its Irish counterpart, as managing director for Ireland & UKStephen Bowcott explains. One major difference is the type of businesses among the region’s largest contractors. “Aside from Bam Construction, which is a plc, the rest of the companies are private,” Mr Bowcott points out. Being free from the demands and requirements of shareholders means the industry is “incredibly flexible” so that if one sector declines, companies can easily shift their focus elsewhere to make up business. Mr Bowcott says being adaptable makes Irish companies very competitive, and he suggests plcs entering the market won’t have the same agility. However, the fractions in the main contractor-subcontractor relationship do occur, as demonstrated by the collapse of Carillion earlier this year. Ireland’s construction industry was rocked by the fall of the UK’s second largest contractor, with Carillion subcontractor Sammon Construction falling into liquidation as a direct result. In 2016, Carillion won a €100m education PPP contract as part of a JV with the Dutch Infrastructure. Sammon was appointed as a building subcontractor to build five schools and a further education institute under the scheme. But when Carillion collapsed, the schools programme was suspended and Sammon had to down tools and stop work, leading to protests at sites across Ireland. It was owed an eyewatering €8m (£7m) by Carillion and could not recover from the blow, eventually folding in June this year leading to the closure of more subcontractors. Despite the challenges new entrants may face, the Irish market is nevertheless pulling them in – with Breedon being one example. The construction materials giant bought rival Lagan Group in a deal worth £455m in April this year. Breedon chief executive Mr Ward says that acquiring Lagan Group has given his firm a platform to replicate its UK business in Ireland, but on a “different scale” – and to expand further into the region by looking at other acquisition opportunities. However, before the chance to buy Lagan Group came up, Mr Ward says the company had only focused on developing its UK business. Tapping into other markets had not been part of the business plan. “[The UK] was always where our resource was going to be deployed,” he says. When the potential Lagan Group deal emerged, Mr Ward says Breedon saw it as a “unique opportunity” for two reasons: Lagan had a solid cash generation capacity, and it offered a gateway into an Irish market experiencing significant growth. “We evaluated the opportunity to buy Lagan and the market it was in, and it was a win-win,” he says. While the UK and Irish construction sectors may differ in terms of contracting mechanisms, similarities can be found in the difficulties businesses face in actually making money. Like UK companies, Irish contractors generally operate on very tight margins, according to Irish trade body the Construction Industry Federation. Policy and government relations director Shane Dempsey says anecdotal evidence from CIF’s members suggests their average margins are between 1 per cent and 1.5 per cent. Mr Dempsey says a primary reason for this is procurement, which he describes as an area of “huge difficulty” for the industry. With the exception of major infrastructure projects, contractors with the lowest-priced tenders will usually scoop the work, Mr Dempsey explains. Furthermore, contracts tend to be awarded on a fixed lump-sum basis. Fail to deliver projects on budget, and you won’t be able to recover the costs, he suggests. This procurement culture is squeezing contractors even more as the cost of materials continues to rise, he adds. With fixed lump-sum contracts, there is no opportunity to recover these rising costs. As well as firms based in mainland Britain, the Republic of Ireland market of course attracts many Northern Irish companies, while a range of projects and programmes have cross-border stakeholders and supply chains. Belfast City Council director of property and projects Gerry Millar agrees with Mr Dempsey that public sector procurement is heavily weighted towards lowest cost. Local authorities will usually use a metric system for tendering work, he says, weighted either 80:20 or 70:30 towards price over quality. He sympathises with the industry and describes the central government tendering systems as overly complicated, affecting not only contractors but also clients. “[Procurement] takes too long, is very risk-adverse and slows things down,” he says, arguing for a more simplified model to replace the current system. Just over two years ago, the UK was in the throes of EU referendum campaigning. Back then, the potential impact of Brexit on the relationship between Northern Ireland and the Republic drew little attention. But as Westminster rushes to secure a Brexit deal ahead of the UK’s March 2019 departure date, this relationship is now a major consideration as negotiations rumble on. One of the most difficult questions is what form a border might take between Northern Ireland and the Republic. Depending on how this is addressed, there are fears it could sour relations politically, socially and economically. Indeed, a hard border could have impact the development of mega-projects spanning both sides, such as a high speed rail link between Dublin and Belfast. The Irish government’s National Development Plan 2018-2027 report stated that strengthening links between Belfast, Dublin and Cork would be examined, with the aim of “developing the wider economic and societal potential of the island”. A high-speed line between Dublin to Belfast would be explored to this end, the report added, along with Dublin-to-Galway and Dublin-to-Cork lines as well. However, the possibility of a hard Brexit has raised question marks over the project. Speaking at a Oireachtas Jobs, Enterprise and Innovation Committee in December 2016, Northern Ireland infrastructure minister Chris Hazzard said a hard border could take the project into “unknown territory”. He added that it could also pose “serious questions around funding”. Despite the clear risks, the CIF’s Mr Dempsey points to potential opportunities for the Irish construction market as a result of Brexit. European companies with UK offices – or UK companies themselves – may decide to relocate to the Republic, he suggests, given the lack of language barriers and its alignment with the EU market. John Sisk & Son’s Mr Bowcott agrees that Brexit is problematic, but argues that the risks posed by US president Donald Trump are just as significant. He suggests that tariffs set out by the Trump administration, which include construction materials such as steel, will have a knock-on effect on international markets and prompt clients to scale back investment plans. As Trump pressures US businesses to stay in America with the incentive of reduced taxes, Mr Bowcott says he has also noticed major US companies investing more in their domestic operations. “From a risk point of view […] I think Trump is equally as much of an issue as Brexit,” he says. With major public sector pipelines on the table and the government pushing for overseas firms to enter the market, now could be the ideal time for UK contractors to cross the Irish Sea. There is uncertainty over the Brexit fallout and Trump’s tariffs – but these are not issues exclusive to Ireland. Even if the industry does ride this wave, UK contractors may face difficulties integrating into a flexible and highly competitive market, where supply chain loyalty is an important part of delivering successful projects. However, the opportunities are there, as Breedon recognised earlier this year when buying Lagan Group. The question is: which other UK companies are willing to take the plunge?